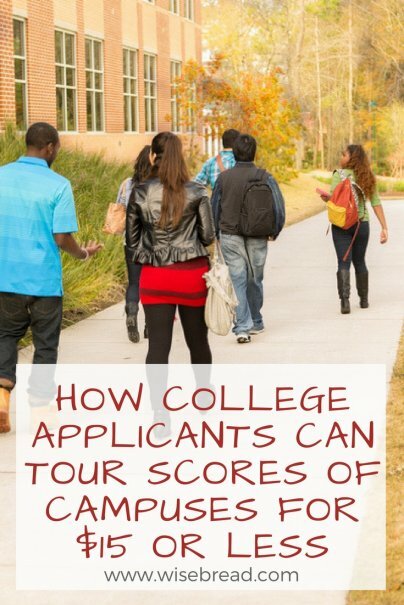 It's nothing new for high schools to host college fairs. They're a quick way for students to learn about a large number of potential schools. What's new is that increasingly, reps at those fairs are handing teens Google Cardboard or other virtual reality headsets so they can take a quick tour without ever leaving their high schools. Saint Francis High School, a private Catholic school in Mountain View, California, recently hosted a fair where two colleges were giving virtual tours, said counselor Hector Camacho. He thinks the higher education market was wise to become an early adopter of virtual reality. "When we're discussing fit, it's one thing to describe a college on paper, but it's a whole other thing for a student to take a virtual tour of a school across the country," Camacho says. A virtual tour is, at its simplest, a series of photos of the college campus that can be viewed from 360 degrees. You won't need a high-end VR headset like an Oculus Rift. Colleges want as many students as possible to take the tours, so you can usually view them on a computer, on a tablet or phone for free, or for a more immersive experience, on the $15 Google Cardboard. Where to find college virtual tours? One place to start is ECampus Tours, which provides 1,300 of them, including one of Harvard, where you can see the chandeliers in the freshman dining hall or the shops at Harvard Square. These tours are generally 360-degree photos that you scroll through, not something you wear a headset to view. Beyond that, look on the school website. Usually, the "visit campus" section has a link to the virtual tour if the school has one. Beyond the views on ECampus Tours, you can see more of this coveted institution through its own virtual tour — which costs $0 to view. The photography here is really beautiful, especially of the stained glass in Memorial Hall. On Princeton's virtual tour, which you can click through on a computer or download the app to view on your phone using a VR headset, you follow a footpath through campus as if you were really walking around. It even has a recorded student tour guide to tell you what you're seeing — in multiple languages. This Ohio school integrated its free virtual tour with the campus interactive map, so you can seamlessly "walk" from place to place. SCAD's tour is everything you'd expect from an art school. The beautifully designed presentation allows you to take it as a free 2D guided tour as an introduction to the school. The school sends new students cardboard VR goggles in its welcome package so they can enjoy the tour in 3D and learn more about the campus. This San Antonio, Texas, school's virtual tour is available for computers, mobile devices, or even Oculus Rift. Highlights include the Murchison Tower and the Esplanade. This Connecticut school wisely took the 360-degree photos for its virtual tour in autumn, so that you can do some leaf-peeping from your desktop or VR headset. The student tour guide mentions the places where Katharine Hepburn, who grew up in a home now part of the campus, used to play. Admire blue California skies while "strolling" outside the Cesar Chavez Student Center or admire the boulevard leading up to Sather Tower in this virtual tour. Not content with just one tour? This New Hampshire school offers virtual tours of the campus, the engineering department, and the athletics programs.